These delicious, soft and low calorie protein bars taste just like cheesecake, with low content of carbohydrates. Inside you will find hidden juicy apple pieces and fine cinnamon flavor. They are fluffy as a cloud and very easy to prepare, you will get to love them for sure. These tasty fitness protein bars are gluten-free and sugar-free and do not contain any added oil to maintain low fat and calorie content. 1 out of 5 bars contains only 87 kcal, 6 g of carbohydrates and 10 g of protein. It is not necessary to add in any sugar, because they are sufficiently sweet due to the protein powder and apples. I like to use vanilla protein powder in these bars, sweetened with stevia, but you can experiment and use your favorite protein powder. 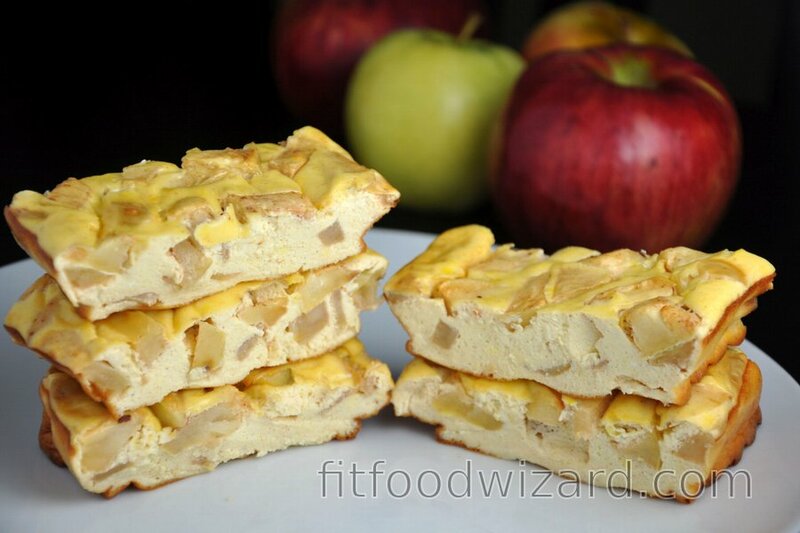 Pack these low carb protein cheesecake bars with apples with you for a long trips, to school, work or gym. Bars will fill you up well and give your body the right dose of protein, while you will enjoy its taste. To prepare them, you will only need 5 ingredients - eggs, yogurt, protein powder, apple and cinnamon. It is preferable to use protein concentrate or mix concentrate + isolate for baking, because the resulting products baked with the protein isolate are too dry. Cut apples into small cubes and sauté with a pinch of cinnamon in a dry pan (approximately 3 minutes). In a bowl, mix yogurt, eggs, and protein powder. If you’re not using sweetened protein powder, add some stevia to taste. Fold in dry-sautéed apples and pour into a bread mold (or different mold) lined with parchment paper. If using a silicone mold, you don’t have to line with parchment paper. Bake 40 minutes at 180 degrees Celsius (350 °F). After baking, let dough cool, then take it out of the mold and cut. I am a fit food wizard and I conjure up these healthy and tasty fitness recipes out of healthy ingredients. My goal is to show you that eating healthy & fit can really be easy, tasty and not boring at all. So come and conjure up some healthy recipes with me!